Head out for a night on the town with proper identification! 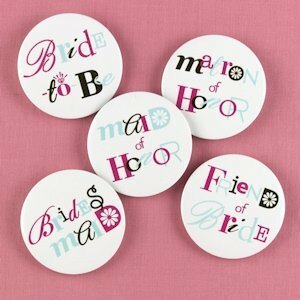 These contemporary buttons will identify the members of your bachelorette party as those who are celebrating with the bride on this very important occasion. Our fun and colorful buttons come in a set of twelve including one "bride-to-be", one "matron of honor", one "maid of honor", four "bridesmaid" and five "friend of bride". Each measures 2-1/4" in diameter.